The public viewing platform situated at the junction of the old harbour warehouse and the modern glass structure above it is a magnet for visitors. 26,000 people visited the Plaza on the weekend following its official opening on 4 November 2016. Up to 17,000 Hamburg residents and guests from all over the world make their way to the HafenCity daily to enjoy the breathtaking 360° view of the city and harbour from a height of 37 metres above ground level. This places the Elbphilharmonie on the list alongside Europe's other most popular attractions, such as the Sistine Chapel in Rome, which has a comparable annual number of visitors. The Plaza is open to everyone – not just concertgoers and hotel guests. You are welcome to come up and enjoy the fantastic view, discover more about the architecture or meet friends for coffee and a snack – from 09:00 to 24:00 daily. Due to Family Day, the Plaza is closed to the public from 11:00-19:00 on 29 June and from 09:00-19:00 on 30 June. The Elbphilharmonie Plaza is accessible to everyone. The restricted capacity of the Plaza is regulated by the issue of Plaza tickets. 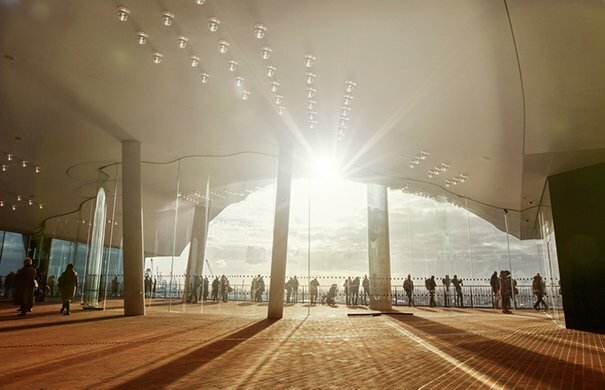 Ticketholders for concerts in the Elbphilharmonie Grand and Recital Halls gain admission to the Plaza from two hours before the start of the event. Visitors to the Kaistudios and all other visitors require a separate Plaza ticket to visit the Elbphilharmonie Plaza. Plaza tickets can be booked up to 12 weeks in advance. Children under the age of three do not require a ticket. Same-day visit: Plaza tickets are available free of charge from the Elbphilharmonie Visitor Center, from the information counter at the main entrance area of the Elbphilharmonie and online (€2.00), subject to availability. Advance booking: Plaza tickets booked at least one day in advance are available from the Elbphilharmonie Visitor Center and online. A booking fee of €2.00 per ticket applies. 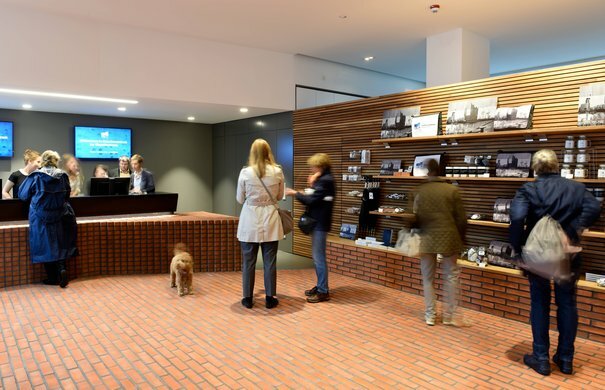 Same-day visit: Plaza tickets are available from the Elbphilharmonie Visitor Center, from the info point at the main entrance area of the Elbphilharmonie and online. A booking fee of €5.00 per ticket applies. Advance booking: Plaza tickets booked at least one day in advance are available from the Elbphilharmonie Visitor Center and online. A booking fee of €5.00 per ticket applies. Plaza tickets for a same-day visit are available free of charge for families of six persons or more from the Elbphilharmonie Visitor Center (Am Kaiserkai 62). Advance booking is available in person and is subject to a booking fee of €2.00 per ticket. Tickets are available free of charge for school and kindergarten groups of six persons or more from the Elbphilharmonie Visitor Center (advance booking not possible). Payment is accepted via PayPal, SOFORT Online Bank Transfer, Amazon Pay or with credit card (MasterCard or VISA). It is not possible to reserve Plaza tickets by phone. Plaza tickets can be purchased online as either Print@Home or mobile tickets. Tickets booked in advance are subject to a booking fee from €2.00 per ticket. Advance booking for a future visit to the Plaza is possible in the Elbphilharmonie Visitor Center (subject to a booking fee from €2.00 per ticket). Plaza tickets for a same-day visit are also available here free of charge (subject to availability). 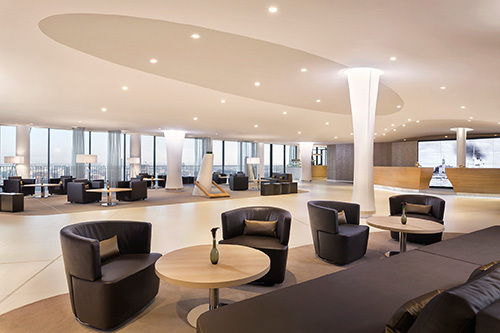 In the interior area of the Plaza you will find stairways and lifts to the concert halls, the takeaway café »Deck & Deli«, and the lobby of »The Westin Hamburg« hotel. 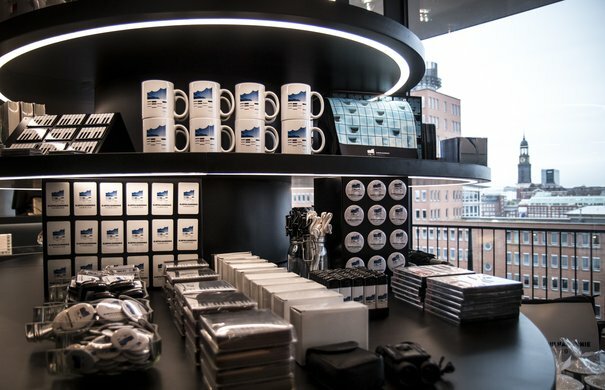 Information on the Elbphilharmonie, books, CDs and souvenirs are for sale in the Elbphilharmonie Shop. 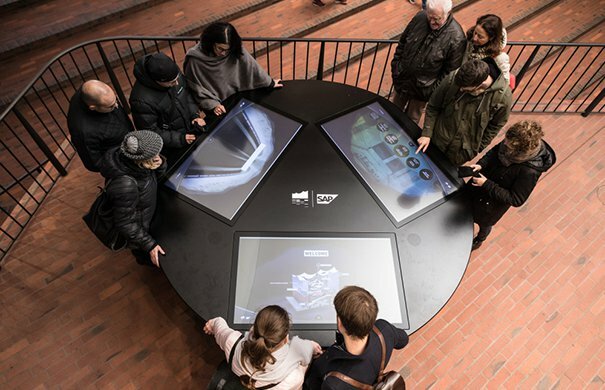 Visitors can discover the Elbphilharmonie in different ways with the Smart Table, a digital infotainment table – from a high-speed drone flight to a detailed picture gallery. Dramatic reflecting surfaces, vistas, approaches and passageways are all important architectural features of the Elbphilharmonie. This includes the Plaza: in the centre point of the Plaza, a light shaft allows visitors to get a glimpse of floors 12 to 17 of the Grand Hall foyer. Several areas of the Plaza are covered with reflecting glass, shimmering fragments of harbour life, the sky and the city. Particularly prominent are leaning columns that allow for an unobstructed flow of people on the Plaza. From the outside, it seems as if the glass structure is floating above the old red-brick warehouse. At approximately the centre of the Plaza on both longitudal sides of the building, two eight-metre-high wind deflectors open up to reveal large facade cutouts that overlook the inner city and the harbour. Visitors can walk all the way around the Elbphilharmonie on the outer Plaza. 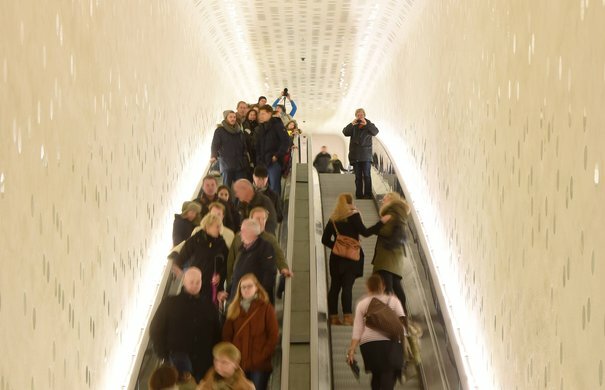 The way to the Plaza is an experience in itself: from the main entrance of the Elbphilharmonie, an 82-metre-long, curved escalator with elaborate lighting leads visitors up through the old Kaispeicher building. 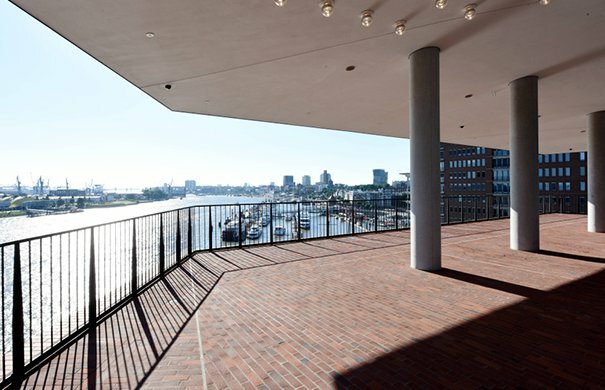 At the top, on the 6th floor, a panorama window offers a spectacular view down the river Elbe towards the harbour and docks. The entrance to the restaurant »Beer & Dine« is also located here. Visitors then take a second, shorter escalator up to the Plaza on the 8th floor. Approximately 8,000 discs glitter in the two-way Tube – the world’s first curved escalator, with a total travel time of approx. 2.5 minutes. Information on the Elbphilharmonie, books about the genesis of the concert hall, and the history of Hamburg and its music scene, biographies about famous musicians and many more books on the subject of music are for sale in the Elbphilharmonie Shop. Also available: a selection of the newest CDs by many artists featured in the first season at the Elbphilharmonie as well as original Elbphilharmonie souvenirs – from Elbphilharmonie umbrellas and tote bags, to memo blocks, mugs and keyrings. 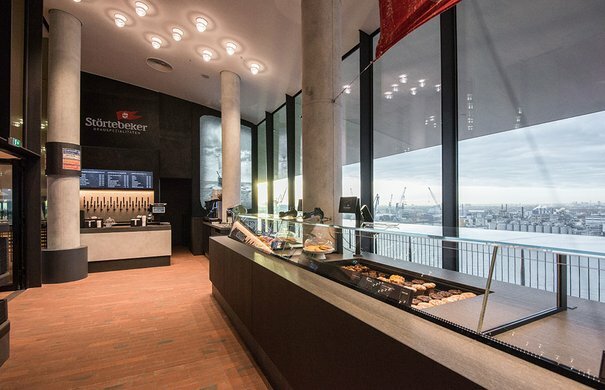 On the Elbphilharmonie Plaza, freshly baked produce, ice cream and tempting cold and warm savoury snacks are on offer. In addition to a large selection of soft drinks, wine, sparkling wine and speciality coffees, visitors can try the complete variety of Störtebeker cask beer varieties. In the upper part of the Elbphilharmonie, The Westin Hamburg’s 244 rooms and suites offer a spectacular view of the river Elbe, the Speicherstadt and the HafenCity. The entrance to the lobby is located on the Plaza. Ticketholders of concerts in the Elbphilharmonie Grand and Recital Halls gain admission to the Plaza from two hours before the start of the event. Visitors to the Kaistudios and all other visitors require a separate Plaza ticket to visit the Plaza. Is a Plaza ticket valid for public transportation? No, a Plaza ticket may not be used as a HVV (public transportation) ticket. Do restaurant customers require Plaza tickets? Yes. Restaurant customers who make a reservation in advance receive confirmation and the corresponding number of Plaza tickets in the form of PDF files by email. How is Plaza admittance regulated? In principle, a Plaza ticket entitles access to the Plaza. The operator, however, reserves the right to limit access, especially in the case of overcrowding. In addition, controls can be carried out by our security company as well as by the police and other regulatory agencies. Every visitor could be subject to a security control. Visitors first take the lift to the ground floor from the parking garage. Upon presentation of a Plaza ticket, visitors may then access the Plaza from the main entrance area via the Tube or lifts. Video recordings and photography for private purposes are permitted. Please respect the privacy of other visitors and do not interfere with regular Plaza operations. Employees may not be photographed or filmed. Video recordings or photographs for editorial or commercial purposes are only permitted with prior approval from the Press Office of the Elbphilharmonie. Smoking is prohibited throughout the entire premises of the Elbphilharmonie. This includes the Outer Plaza on floor 8. Free public toilets are located on the western tip of the Plaza, adjacent to the Elbphilharmonie Shop, and are accessible via stairs. Persons with mobility disabilities and wheelchair users may use the B elevators situated at the entrance of the Elbphilharmonie Shop. The accessible toilets are open – a key is not required. Further toilets are located behind the ticket shop at the main entrance of the Elbphilharmonie. Free, public WiFi (Mobyklick) is available on the Plaza. Is the Plaza accessible for persons with mobility disabilities? Yes, the Plaza is fully accessible via lifts. These are located in the main entrance area of the Elbphilharmonie (please follow the signs). May dogs be taken onto the Plaza? No, animals are prohibited on the Plaza, however disability assistance dogs may enter the Plaza. Who should I contact if I find or lose an item? Found items should be handed in to security staff on the Plaza, at the main entrance or in the Security Office on the south-east corner of the Elbphilharmonie. Lost items can also be retrieved here. What protective measures are in place in the event of flooding? The Elbphilharmonie is located in a safe high-water area, therefore no flood control measures are in place in the event of flooding. Closures that could occur in the areas surrounding the Elbphilharmonie may result in restrictions when travelling to and from the Elbphilharmonie.